Today the newest addition to the RindyBerry laying flock is officially one week old and doing great! Last Monday we took a drive to Abendroth Hatchery where we were greeted by the owner plus a couple of tables full of peeping boxes waiting for pick up. 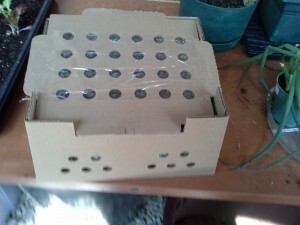 Here is a picture of the box our 12 Black Australorp pullets road home in. The first few weeks are the most critical, so we decided to set the brooder up in our solarium. This works out great in that it keeps the dusty mess out of the house, but yet they are close by for observation. Shortly after we got them settled into their new home, our friend Kristi brought over the four Rohde Island Red chicks she hatched for us. 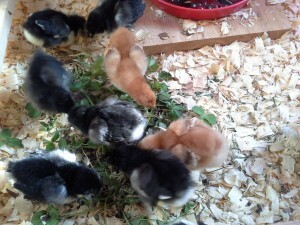 Both sets of chicks are the same age and new to the environment, so no major squabbles. Since they won’t have a mama to keep them warm, we adjusted the brooder lamp so the temperature would be around 90 degrees for the first week. 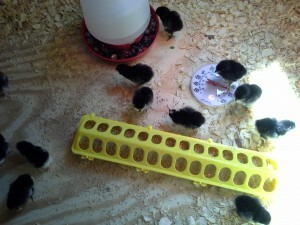 Now that they are a week old, we will set it up to a temp of 80 degrees. 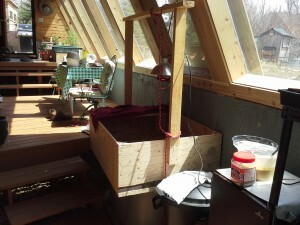 After about four days it was time to clean the brooder. 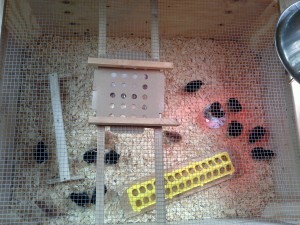 We moved their feed and water onto boards to help keep out some of the bedding they kick up while foraging. Rod added a little roost. 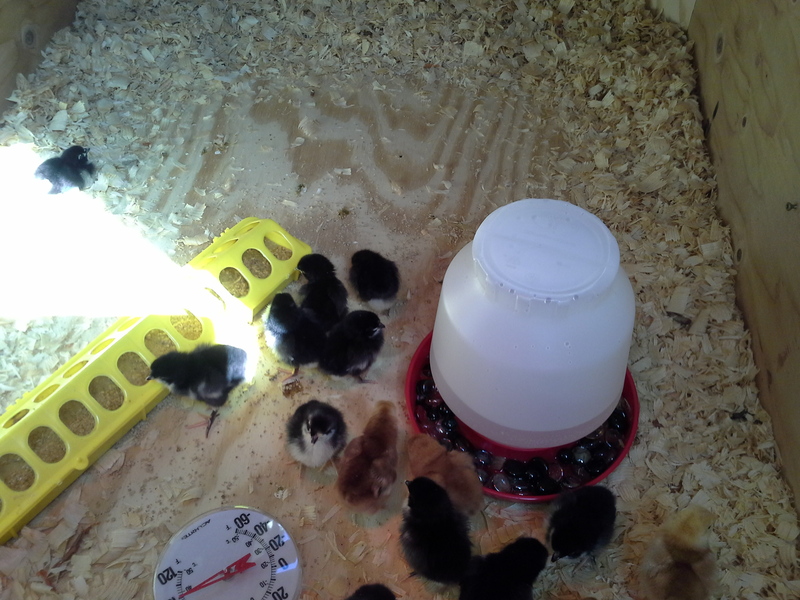 It sure didn’t take long for them to figure that out and begin establishing the pecking order. He also added some clover . . . that was a huge hit! Baby chicks at this age are all fuzzy and cute, but it won’t last long. Already they’re wing and tail feathers are beginning to come in as they approach that adolescent stage. 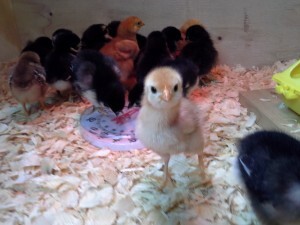 ← Broody or not Broody . . . that is the question.